Nasdaq Stockholm and the first trading date was May 15th. record date May 11th 2018. Nordic region. The new iGaming brand Hyggespil.dk was launched on June 19th. • May 1st 2018, Aspire Global’s Danish gaming license was extended until 2023. • August 7th 2018, Aspire Global submitted the application for a Swedish gaming license. I am pleased to present the second quarter. Both revenues and EBITDA hit record levels, reflecting the strong performance of several partner brands including Karamba, combined with a great interest in our sports solution that was launched in the first quarter. The second quarter delivered excellent results with strong contribution from several key partners. Revenues increased by 43% (55% excluding closed markets) while EBITDA improved by 58% compared to the corresponding quarter last year, which also included substantial revenues from the Australian market that was discontinued on September 12th, 2017. The strong performance is mainly driven by two factors; successful partnerships and a stronger offering. Firstly, we have improved our ability to focus our resources on the partners and brands with the highest potential and strongest performance. As for the offering, we continuously improve our solution, both in terms of quality and width of the solution, most recently through the upgrade to a more advanced platform system and the very promising launch of Sportsbook as well as higher efficiency in our data-driven tools. As a result, several B2B-brands are outperforming, along with higher activity for B2C. 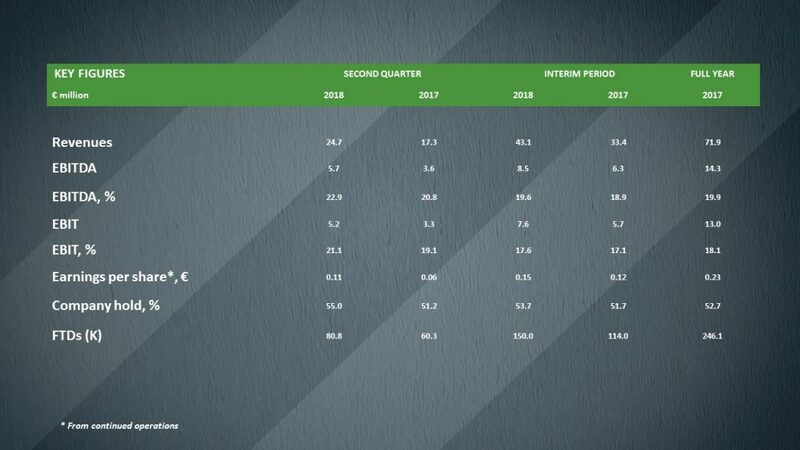 The second quarter was the first full quarter to include revenues from the sports vertical which immediately grew to nearly a tenth of the B2C-revenues and boosted the performance for the two partners who were live with Sportsbook, Goliath and Nossa Aposta. The World Cup contributed to the interest in our product and we hope to maintain momentum as the Champions league starts off in the coming month along with European Club football. We look forward to launching Sportsbook with additional partners going forward. We recently signed an agreement with BetRegal, a sports operator that will be migrating to Aspire Global from a competing platform during the fourth quarter of 2018. The migration is strategically important as it confirms the competitive advantage of our sports solution; something that makes me proud. As for Karamba, Sportsbook is attracting a whole new audience to the proprietary brand. In the first six months, we invested in a unique front-end for Sportsbook (including the tool for bet recommendation) as well as marketing around the launch. We also re-organized the team to realize the full potential of the brand, and the effect so far has exceeded our expectations. Aller Media Denmark recently became one of the first Nordic media house to add an iGaming offering to their business through a partnership with Aspire Global. The deal was signed in April, and already in June the new brand Hyggespil.dk went live, offering a wide range of casino games. We look forward to following their progress and we believe that the partnership with Aller Media will be an eye-opener to other companies outside the traditional gaming industry as it demonstrates the potential for companies with significant online traffic to capitalize further on their assets. “Everything we do, we do to enable our partners achieve their full potential”. In line with our vision, we continue to improve our offering by developing our turnkey platform, exploring additional verticals and expanding our game portfolio including proprietary game development. Furthermore, we continuously evaluate new partnerships as well as potential transactions, focusing on innovative partnerships in regulated markets. We recently submitted the application for a Swedish gaming license in line with this strategy. Being a company with stable growth and high ambitions, we also increase our efforts to communicate with the capital market. On September 13th 2018, we will be hosting our first Capital Markets Day in Stockholm where we are looking forward to meeting with many of our shareholders, analysts and media to present the company and the investment case more closely. (MAR) and the Securities markets Act. The information was submitted for publication by the contact person above at 08:15 am (CET) on August 14th 2018. Today, on August 14th 2018, at 10:00 (CET), the company CEO, Tsachi Maimon, and CFO, Motti Gil, will be presenting the report and answering questions at a teleconference (in English), which will be webcasted live through the following link: https://financialhearings.com/event/10983. The meeting, including the Q&A-session, is also available by calling one of the telephone numbers below. The complete interim report is available at http://www.aspireglobal.com/wp-content/uploads/2018/08/AGQ218-final-report.pdf and the presentation material can be found on the company website.